I’m glad I didn’t go with the 17 mile dirt road drive at Monument Valley Navajo Tribal Park yesterday, as I spent most of this morning off roading. My first destination for the day was to Muley Point which can be reached after climbing 1,100 feet over three miles along a dirt road with 10% grades and 5 mph switchbacks. A variety of road signs prohibit RV’s, vehicles over 10,000 pounds, and trailers. Within the first mile, I encountered all three…giving me second thoughts about making the ascent given I have a 9,500 pound vehicle. 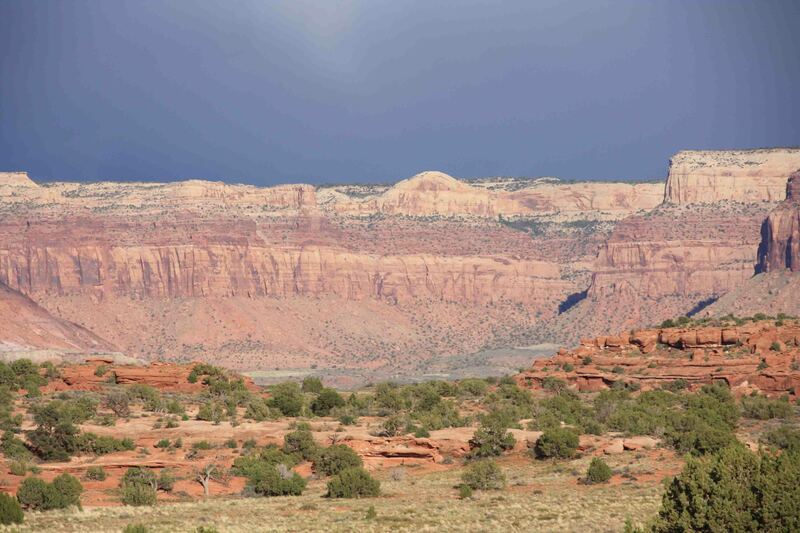 After the three mile scramble up Moki Dugway, visitors must turn left on Muley Point Road that is “Impassable When Wet”. I presume due to the softness of the road given it was relatively smooth and flat. I was so pleased I reached the flat road that it wasn’t until I was three miles along that I realized storm clouds looming in the distance were dumping rainwater nearby. I pressed the gas and sped down the washboard road to the overlook. Before hopping out of VANilla I checked my geocache app on my iPhone for nearby caches. While my iPhone was searching, I shuffled to the ledge in a crouched position to keep the wind from knocking me to the ground while my hair was flying out of my pony tail. I became so focused on keeping my camera still and remaining safe, I forgot to recheck my iPhone application until I had sped two miles away from the overlook…three caches…dang it! Oh well, I’d rather not be stuck on a muddy road out to a cliff. VANilla, Petey, and I safely returned down Moki Dugway to another 17 mile dirt road that wanders through the Valley of the Gods. No road signs warned of dangers in this area, so at the suggestion of the Reader’s Digest book, I spent the next hour or more bouncing along the rocky red road past countless towers, pedestals, and buttes reaching to the sky. I covered about 16 miles through the valley before the skies unleashed. Low lying areas instantly began filling with water. In a few minutes, thankfully, I reached the highway. I spent the next 15 miles driving in the rain and tiny bits of hail to Bluff where I went in search for the Laundromat with showers. I missed the Laundromat the first time, but stopped off at Bluff Fort when I met Karen and Bernice at the visitor’s center. While driving rain washed off VANilla better than the recent gas station car wash, Karen and Bernice pointed me to the Laundromat and fed me information about the fort. Mormon pioneers came by wagon train from Escalante into southeastern Utah in 1880. The expected six week journey, took six months. The fort consists of reconstructed buildings funded by descendants of the families that settled the area. Given the cold, wet weather, I only peeked at the fort from the visitor center door before asking a few more questions about the area. I had wanted to see an old suspension bridge, though wasn’t sold on visiting it in the current conditions, so when I heard it was washed away in a flood, I felt a little better on not missing out on something cool. We said our goodbyes, and I steered VANilla directly to the showers…only $2.50 for unlimited hot water! We pressed on through the lightened drizzle to Blanding and Edge of the Cedars State Park. I took Petey for a quick walk outside of the museum before another barrage of storms came through. Given the weather, I opted out of the $5 entry fee to see some Indian ruins since I have seen several in the last three months and took the opportunity to blog. As the rain turned to a mist, we moved onto Monticello where we stocked up on groceries preparing for the limited services on the way to the Needles District of Canyonlands National Park. I am currently camped on BLM land about five miles outside the park near Hamburger Rock Campground in the undeveloped areas alongside the dirt road. At first, I stopped at the private campgrounds, Needles Outpost, and inquired about amenities, the price, and how many sites were available, but the lady was so rude that I just left. I saved myself $20 for similar facilities given the sign posted on the office door directed campers to the Visitor Center and Squaw Flat Campground in the park to acquire running water. No sense in paying for amenities that aren’t available. Not to mention, my roadside view of the bluffs and mesas situated beneath a snow capped mountain as the sunset is quite nice. I plan on venturing through Canyonlands in the morning before continuing north to Moab and Arches National Park tomorrow afternoon. ETB.